Being the anti-hero is tough. Toeing the line between saint and sinner requires a delicate approach: you need the resolve to do whatever it takes to succeed, while still retaining a reluctant allegiance to the triumph of good over evil. When executed well, the anti-hero serves as a vessel for guilt-free fantasy fulfilment. Done poorly, however, the ruthless protagonist becomes a monster not even a mother could love. Not a Hero, as the title suggests, aims to leverage the not-quite-a-villain setup in service of an unbounded power trip. Too bad its accuracy leaves a lot to be desired. At first glance, Not a Hero appears to subscribe to the same meme-laden internet humour that so many recent retro-inspired games wrap themselves in. As overplayed as that trope is, I would have preferred it to the approach Not a Hero actually takes. Rather than lolcats and cheezburgers, it’s uninhibited nihilism and mass murder that make up the ‘funnies’. The game has no shame; no topic is too tender, whether it be racism, ageism, bigotry, or just plain misanthropy. The main character, your boss Bunnylord, embodies just about every foul trait you can think of. He is a monster, literally and figuratively. He revels in the death of his opponents whether they deserve it or not, and laughs off the countless innocents caught in the crossfire. Worst of all, it’s your mission to help him become Prime Minister and effectively take over the world. Say what you want about politicians, but Bunnylord takes evil to a whole new level. To be fair, Not a Hero doesn’t try to glorify its chauvinistic megalomaniac. 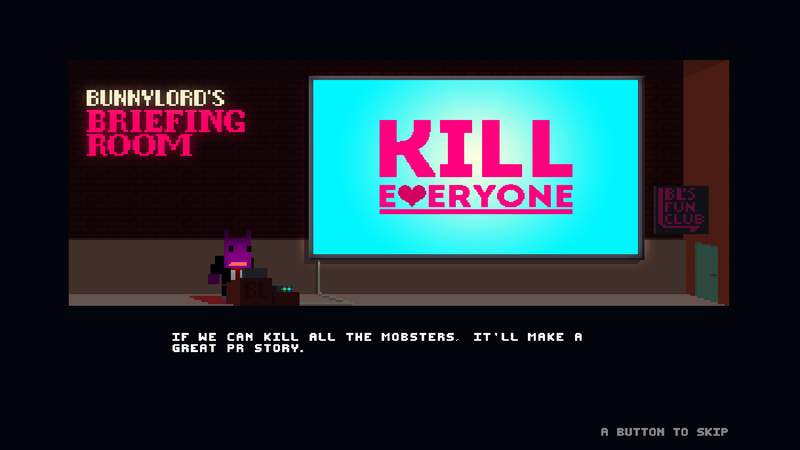 Rather, much like the graphic violence of Game of Thrones or the political incorrectness of It’s Always Sunny in Philadelphia, Bunnylord’s malignant behaviour is designed to shock and disgust for the sake of grabbing attention. And in that, it succeeds; I am writing about it, after all. Contrary to the old adage, though, any publicity is not good publicity. More often than not, Bunnylord’s irreverent comments disturbed me so much that I had to skip through story sequences to save myself from the sick feeling they induced. But that meant I missed out on the few good jokes buried within the filth, along with motivation and context for my actions within the game proper. Sure, I was hardly missing out on a Hemingway-calibre narrative, but I would have liked some sort of justification for blasting the bad guys. And it’s that blasting that is Not a Hero’s saving grace. At its core, the run-and-gun gameplay is sublime. Developer Roll7 has taken the stylish rhythm of its Olli Olli games and translated it brilliantly to a side-scrolling shooter. Levels are short, chaotic, and - critically - feature instant restarts for when you inevitably get back-stabbed by a surprise ninja. The snappy cover system and the ability to slide tackle enemies keeps the action moving at a pace more like Sonic than a typical 2D shooter, creating a similar sense of flow to games like Mirror’s Edge or the criminally underrated Vanquish. Every failure teaches you something, your many deaths culminating in that one perfect run that echoes the rapturous relief captured in the likes of Trials and Super Meat Boy. Optional objectives add further nuance to the action, encouraging repeat runs with new characters and tactics. There’s even a light element of puzzle-solving, thanks to the smart, multi-route level design. It didn’t matter how many times I died; the thrill of the fight coaxed me into just one more shot every time. Alas, after every hard-fought victory, my elation would quickly wither with the return of Bunnylord and his sickening non-sequiturs. Even hammering A and skipping through his dialogue couldn’t shake the sense of wrongness pervading my enjoyment. All desire to keep playing would die in a wave of guilt for aiding and abetting such a despicable being. Something tells me that wasn’t the result Roll7 was going for. A gorgeous 80s aesthetic wasn’t enough to save Hotline Miami from my shame pile. This isn’t the first time I’ve been conflicted about a game. I like having my beliefs and assumptions challenged; it broadens my perspective and helps me empathise with viewpoints different to my own. But baseless, unwarranted vulgarity teaches me nothing. It’s not like witnessing the depths of Bunnylord’s depravity opened my eyes to the corruption plaguing our society. I already know the real world can be a sick and twisted place; I don’t need games to remind me of that. A couple of years ago, I encountered the same sort of emotional dissonance with the release of Hotline Miami. On a mechanical level, the game was eminently successful, as attested to by the effusive critical praise it received. Thematically, though, it left me with an awful taste in my mouth. Yes, moral discomfit was the game’s intent, but for me it was simply too noxious and exceeded my capacity for perturbation. Dealing with the dark side of humanity doesn’t have to be so disgusting. Spec Ops: The Line, Heavy Rain, and Telltale’s The Walking Dead all confront ugly truths without tainting their core experiences, thanks to the way they contextualise their subject matter. Bad stuff happens, but it’s always appropriate to the situation. In The Walking Dead, you’re not going around chopping people’s limbs off indiscriminately; the desperate measures are restricted to desperate times. Not a Hero, on the other hand, insists on being gross for the sake of it. It’s the same over-the-top approach the Saw films take, and it’s why I much prefer something like Se7en or Cabin in the Woods that employ gore for more than just pure titillation. Not a Hero is a real disappointment. I want to love it, but for every moment of blood-pumping excitement, there’s another of stomach-turning revulsion. If only it had justified its lewdness better, it could have been something special. Instead, it’s just a rotten shame.